Itjtawy /ɪʃˈtaʊwi/ (full Egyptian name Amenemhat-itj-tawy — "Amenemhat, Seizer of the Two Lands"), is the as yet unidentified location of the royal city founded by Twelfth Dynasty Egyptian King Amenemhat I, who ruled from about 1991 BC to 1962 BC, during year 20 of his reign. 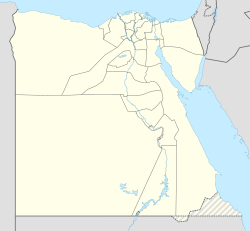 It is located in the Faiyum region, and its cemeteries were located at Lisht, el-Lahun and Dahshur. The site of Itjtawy may have been chosen due to its proximity to the source of Asiatic incursions into Egypt to help prevent further attacks. ^ Arnold, Dorothea (1991). "Amenemhat I and the Early Twelfth Dynasty at Thebes". Metropolitan Museum Journal. The Metropolitan Museum of Art. 26: 5–48. doi:10.2307/1512902. JSTOR 1512902. ^ Shaw, Ian, ed. (2000). The Oxford History of Ancient Egypt. Oxford: Oxford University Press. p. 159.